On Friday, audio giant Bose emerged as the latest, and perhaps the most surprising company to announce that it's planning to release augmented reality smartglasses. There's just one problem: these smartglasses don't present any visual content whatsoever. The wearable is associated with Bose's new so-called "AR platform" that the company is unveiling this week at SXSW, and it's intended to augment what you hear rather than what you see. While the device certainly looks much cooler than most smartglasses that we've seen, the prototype device has no microdisplays for visual data or cameras to capture what the user sees. Instead, the wearable includes a tiny "acoustic package" in the arms of the glasses that deliver sound that only the user can hear, along with microphones for user voice input and sensors to track head motion. "Bose AR represents a new kind of augmented reality—one that's made for anyone and every day," said John Gordon, vice president of the Consumer Electronics Division at Bose, in a statement. "It places audio in your surroundings, not digital images, so you can focus on the amazing world around you—rather than a tiny display." 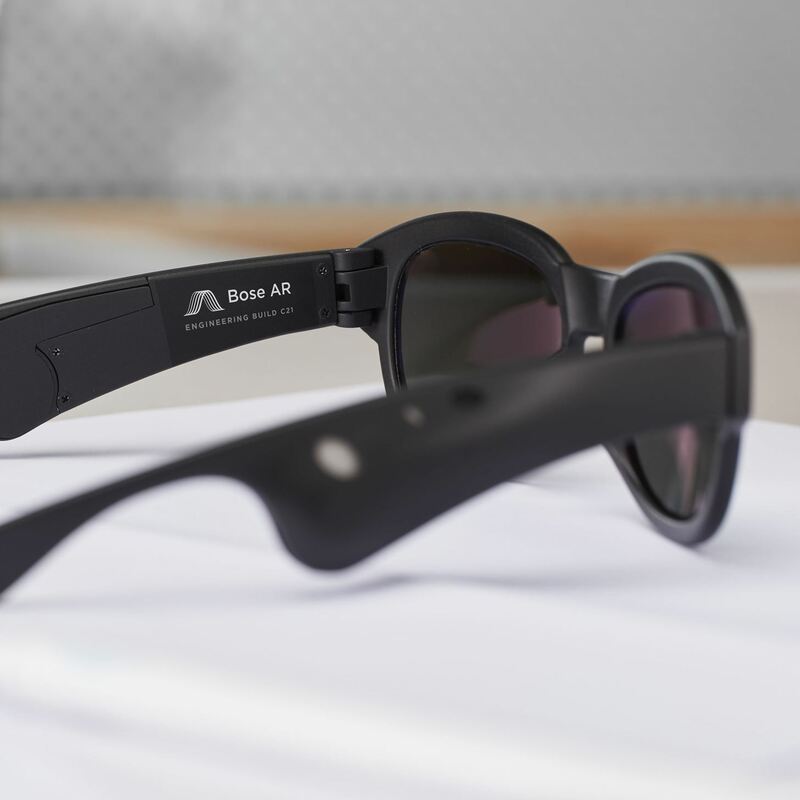 The glasses connect via Bluetooth to an iPhone or Android device, feeding location data to the wearable. The aggregated data is then sent to an app running on the newly-launched Bose AR platform. In turn, the app returns a relevant audio response. According to Bose, the prototype device could be used to do things like recreate sounds from historic events when visiting real world landmarks. And in classrooms, apps could translate signs or tell a story behind a famous painting. The prototype glasses, along with the Bose AR SDK, will be available in limited quantities this summer, and interested developers, manufacturers, and researchers are being encouraged to sign up at Bose's developer portal. Currently, Bose is collaborating with ASICS Studio, Strava, TripAdvisor, TuneIn, and Yelp to develop experiences or update existing apps for the platform. The company is also in contact with academic organizations including the MIT Media Lab and the NYU Future Reality Lab to help further study into audio for AR. Bose also notes that other development partnerships exist under non-disclosure agreements, which will be disclosed in the future. 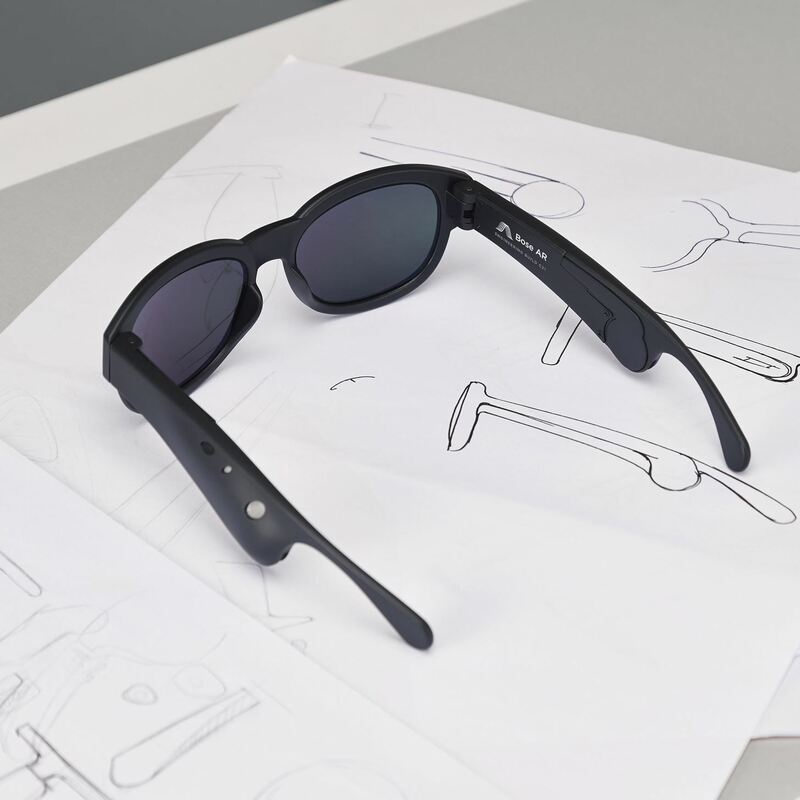 Beyond the prototype, the company is also ready to put its money where its platform is, as its Bose Ventures arm is making $50 million available for investment into startups working with the Bose AR platform. But really, if an augmented reality experience has sound, but no sight, is it still augmented reality? As we've defined it, augmented reality is "a technology that places interactive virtual objects, text, or interfaces within the user's field of view, often within a context- or location-specific relationship to the real world surrounding the user." So, by that definition, no, Bose AR is not "AR." A better description would be: contextually-aware spatial audio. People would expect Bose to introduce this in headphones, but we wanted to show the world that this platform can be applied broadly. When asked why Bose is calling its prototype "AR glasses," a company spokesperson told Next Reality, "People would expect Bose to introduce this in headphones, but we wanted to show the world that this platform can be applied broadly, and be available in multiple form factors." Okay, but...are there even plans to work with wearable companies (perhaps "actual" AR brands) possibly interested in integrating this into a product? "Yes," said the Bose spokesperson. "In fact, discussions are already underway with a number of wearable manufacturers." The history of marketing tell us that, if your product's story isn't particularly exciting, change the narrative, perhaps by associating that product with a hotter category. That appears to be what's at work here with Bose and its attempt to hitch its wagon to the increasingly popular AR train. But just because you decide to call a bobblehead a form of robot, that, uh, doesn't make it a robot. Similarly, Bose's very well-crafted play to brand its wearable speaker as AR is ill-conceived. The worst part is, Bose didn't have to resort to such marketing trickery, the product is actually compelling and noteworthy on its own. It's just not AR.